A deceptively plain and utilitarian drinking vessel of just the right proportions symbolizes the grandeur of the far-reaching British Empire of the late eighteenth and early nineteenth centuries. Officers, merchants and officials of the Colonial Service found themselves in a strange and exotic India of the latter eighteenth century. These adventurers turned to British born silversmiths in Madras, Bombay and especially Calcutta, who, using skilled Indian craftsmen, handcrafted silver in the English tradition. No doubt a British officer or ranking official commissioned this cup from Joseph Rondo, one of the earlier British silversmiths to establish his shop in the Lall Bazaar of Calcutta where he directed his craftsmen from the year 1788. 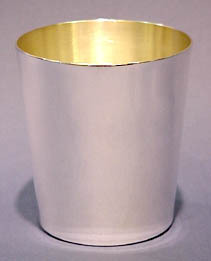 Our sincere hope is for your enjoyment of a Pimm's Cup, gin, whiskey, seltzer water or any other favorite beverage in our hand-crafted sterling drinking cup. The "Raj Cup" is available in a bright finish which, after daily use will patinate to give it the same character as the original. Included in the price is a two-letter monogram of your choice; hand engraved in the same foliated script as the original. The "Raj Cup" bears our hallmark as we have no intent to deceive.